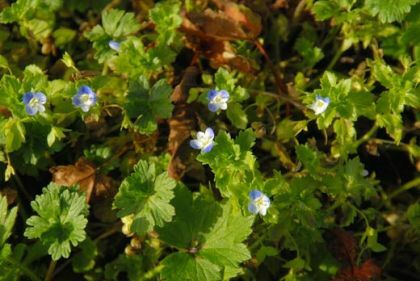 This straggly annual wildflower is perhaps our most frequent Speedwell around the country. Found on bare soil, cultivated and waste ground, it is quite downy. 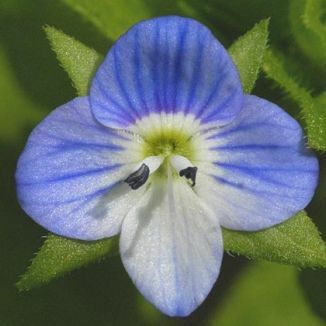 Pretty bright blue flowers (8-12mm across) are borne solitarily on thin, sometimes reddish, stems which only reach to about 20cm high. The corolla has four lobes, the lower one being smaller and white, and it has two stamens. The hairy oval leaves are pale green with toothed margins. This lovely little flower blooms all year round and is a delight to come across on a cold winter's day. It is thought to have originated in Persia, hence the species name persica, and it belongs to the family Plantaginaceae. I first recorded this wildflower in Roundwood, Co Wicklow in 1976 and photographed it in Gibletstown, Co Wexford in 2006. In times past there was a tradition among seafaring folk which was to give travellers a little bunch of blue flowers and wishing them 'Speed Well'.